A 23-year-old woman presented with a palpable lump in her right groin. Physical examination revealed a 3-4 cm fluctuant soft-tissue mass. 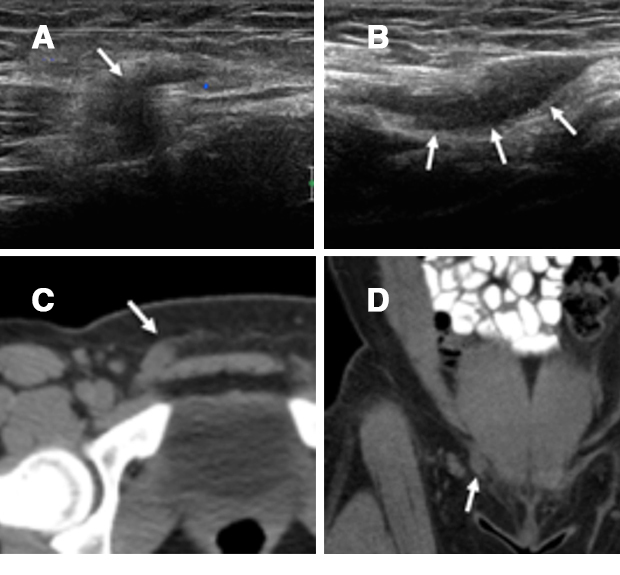 Targeted sonographic examination revealed an area of fenestration (arrow, A) in the anterior abdominal wall with a small collection of adjacent complex fluid (arrows, B). A computed tomography (CT) scan demonstrated a small, nodular soft-tissue density contiguous with the anteroinferior margin of the right inguinal ligament (arrows, C and D). The canal of Nuck represents an abnormal evagination of parietal peritoneum into the inguinal canal. During fetal development, the gubernaculum (precursor to the round and ovarian ligaments) attaches to the fetal gonad superiorly and to the skin of the groin inferiorly. A fold of peritoneum called the processes vaginalis forms along the gubernaculum and protrudes into the inguinal canal, creating the canal of Nuck, which normally obliterates.1 Rarely, the canal persists and can accumulate peritoneal fluid, resulting in a hydrocele. Most hydroceles typically present as a painless, irreducible mass in the inguinolabial region. Since some may communicate with the peritoneal cavity, and many coexist with an inguinal hernia, Valsalva maneuver cannot reliably distinguish a hernia from a hydrocele. Ultrasound findings of a hydrocele of the canal of Nuck include an anechoic or hypoechoic cystic structure in the inguinal region without internal vascularity on color Doppler.2 Absence of bowel or omentum can help differentiate a hydrocele from an inguinal hernia. A hydrocele of the canal of Nuck is an uncommon entity, which should be included with more common differential diagnoses of groin swelling, such as an inguinal hernia. Shadbolt, CL, Heinze SBJ, Dietrich RB. Imaging of groin masses: inguinal anatomy and pathologic conditions revisited. Radiographics 2001;21:S261-271. Patman V, Narayanan R, Kudva A. A cautionary approach to adult female groin swelling: hydrocoele of the canal of Nuck with a review of the literature. BMJ Case Rep 2016;1-3. Mikes Z. JAOCR at the Viewbox: Hydrocele of the Canal of Nuck. J Am Osteopath Coll Radiol. 2017;6(4):22. Dr. Mikes is with the Department of Radiology, Cooper University Hospital, Cooper Medical School of Rowan University, Camden, NJ.